THE threats to the Zimbabwe Electoral Commission (ZEC) by Nelson Chamisa, leader of the MDC-Alliance are indeed unfortunate. They are a futile attempt by a player to influence the outcome of the election. Let us be clear, ZEC as an institution can only do what the laws of the country permits it to do. 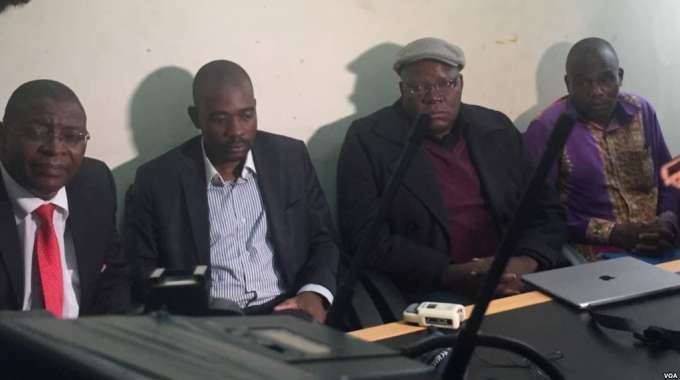 The MDC-Alliance are through the use of threats, insults and outright intimidation of personalities in ZEC, seeking to influence ZEC to allow changes administratively to the Electoral Act, changes they failed to get through the legislature. It is not a secret that the MDC made far reaching proposals to changes to the Electoral Act through Parliament. Some of the changes were accepted and amendments were made. Equally, some of the proposed amendments were rejected and as a party that didn't command a majority, the MDC-T could not force them through. Today, through intimidation, name calling and other extra-legal means, the MDC-Alliance are piling pressure on the ZEC chairperson to get her to administratively make changes they failed to get through Parliament. This is illegal. They are in all essence attempting to subvert the national Constitution to suit their own narrow selfish goals. In an election that has seen the invitation of international observers, we see a single political party out of the 55 political parties making demands that are not in sync with the law. Chamisa is stoking fire by making threats and spoiling for a deadly fight with not just ZEC, but law enforcement agencies - even children are aware that the presence of visitors in the home does not protect them from rules and consequences even before the visitors are gone. In essence, they are breaking the law and the election observers will unfortunately be forced to observe the law taking its course. There is also an interesting new courage found by Professor Jonathan Moyo and his acolytes, including people like Edmund Kudzayi, who are targeting ZEC, in particular Justice Chigumba in support of the MDC-Alliance in interfering with ZEC's independence. Apart from knowing that they are asking ZEC to conduct elections in ways that they want, Prof Moyo is now using the Tsikamutanda approach to politics, making allegations without evidence with the hope of casting aspersions on the characters running the elections. They will not succeed. Chamisa states in his live broadcast "that he will meet ZEC chairperson Justice Chigumba" to iron out their differences. The question to ask is, why would Justice Chigumba meet this one political party in the absence of the other 50 - odd, especially after the barrage of insults the MDC-Alliance subjected her to. Mobs of MDC-Alliance supporters stood outside her offices at ZEC and called her "h*re" while burning and trampling on her pictures. This is not exactly the actions of a person who seeks civility. Good luck with getting that meeting. Chamisa also says he wants to meet President Mnangagwa. Again, the man he has been vilifying at his rallies with impunity, good luck to him getting that meeting as well. Challenged by an international journalist at his live Press conference about the limitations of his options considering the elections were two weeks away and hence the horse has already bolted, Chamisa struggled to answer. Here is a man with no more options but to dance to the tune that is already playing. In the absence of the death of one of the 23 presidential candidates, the elections will - under the laws of the country - go ahead whether the MDC-Alliance dances or not. Irritants like Prof Moyo and Kudzayi are exactly that, they are of no consequence at all. They will soon be relegated to the dustbins of history.